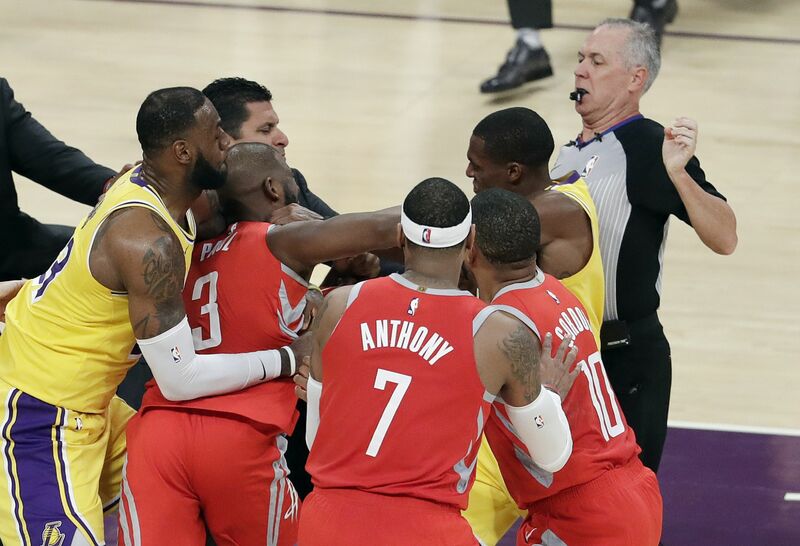 LOS ANGELES -- Rockets guard Chris Paul was suspended for two games for his part in a fight in the fourth quarter of his team's win against the Lakers on Saturday. Paul will miss Sunday's game against the Clippers and Wednesday's game in Toyota Center against the Utah Jazz. "Paul has been suspended for poking at and making contact with the face of Rondo, and throwing multiple punches at him," the NBA said in the announcement of the ruling. Lakers guard Rajon Rondo received a three-game suspension. Lakers forward Brandon Ingram received four games for joining the fight. "Ingram has been suspended for aggressively returning to and escalating the altercation and throwing a punch in the direction of Paul, confronting a game official in a hostile manner, and instigating the overall incident by shoving Rockets guard James Harden," according to the NBA statement. "Rondo has been suspended for instigating a physical altercation with, and spitting and throwing multiple punches at, Paul. " The altercation in Saturday's game began when Ingram fouled Harden with the Rockets, and especially Paul, arguing that the call should have been a shooting foul. Rondo confronted Paul, who had his arms folded in front of him until Rondo's spit or just splattered saliva hit Paul. Paul jabbed a finger into Rondo's face and then pushed, with Rondo retaliating with a hard left hand. Paul landed a punch of his own before Ingram rushed over to throw and land several punches. The Lakers, however, insisted that Rondo did not spit at Paul, though it was unclear if the argument meant that he did not intend to have saliva leave his mouth or that nothing of the sort happened at all. Ingram received two technical fouls and an automatic ejection. Paul and Rondo were given one technical foul each and were also ejected. Paul had 28 points and 10 assists on Saturday in his 30 minutes before he was ejected. The Rockets went 23-2 when he scored 20 points last season and won the one game in which he topped 20 this season. The suspension will cost Paul $491,782, Rondo $186,207 and Ingram $200,428 in salary. Eric Gordon is most likely to start for the Rockets while Paul is out. Gordon averaged 21.5 points and 3.5 assists in his 30 starts last season, 15.3 points and 1.3 assists when coming off the bench.